In part because Darrell Evans retired after the 1989 season with a career batting average of only .248, baseball statistician Bill James has called him “the most underrated player in baseball history, absolutely number one on the list,” due to his power, his ability to draw walks, and his outstanding on-base percentage. He was a good-fielding, hard-hitting third baseman in the National League for 15 seasons before the Detroit Tigers signed him as a free agent before their World Series-championship campaign in 1984. Evans, who played mostly at first base for Detroit, suffered through one of the worst seasons of his 21-year career in 1984, but found his hitting stroke in 1985 and gave the Tigers three more years of solid production. A left-handed batter and a right-handed thrower, Darrell excelled in baseball and basketball at John Muir High School despite his poor eyesight, which he corrected with glasses and, later, contact lenses. He then attended Pasadena Junior College, where he led the baseball and basketball teams to national titles. A power-hitting third baseman, he was one of the most sought-after players in the college ranks, and was drafted five times (once by the Tigers in 1966) before signing with the Kansas City Athletics in June 1967. He performed well in the Athletics’ minor-league system until he suffered torn ligaments in his right shoulder, which hindered his hitting and made it difficult for him to throw a ball across the infield. His future looked bleak, and the team (which moved to Oakland in 1968) decided to groom Sal Bando as its third baseman of the future. The Athletics left Evans unprotected in the Rule 5 draft, and on December 2, 1968, the Atlanta Braves claimed him from Oakland. Evans, who stood 6-feet-2 and weighed about 200 pounds, played in 12 games for the Braves in 1969, but veteran Clete Boyer was established at third base. Evans spent most of the next two seasons with Atlanta’s Richmond farm team. Military reserve duty interrupted his progress, but his fine performance at Richmond in 1970 and 1971 convinced the Braves that Evans was ready for the major leagues. He became the team’s starting third baseman midway through the 1971 season, after a dispute between Boyer and general manager Paul Richards resulted in Boyer’s release in June. Eddie Mathews, the All-Star third baseman of the Braves during the 1950s and ’60s, was a coach with Atlanta when Evans joined the team for good in 1971. “I was just like you when I first came up,” Mathews told the 24-year-old Evans. “I couldn’t catch the ball and I couldn’t throw either.” Mathews spent untold hours helping Evans improve his fielding skills. As Evans commented, “Eddie would hit hard liners and grounders to me at third then, as I got better, he would gradually move up the line and hit them even harder.” Evans eventually became a good third baseman, and his hitting improved with experience. By 1972, when his mentor Mathews became manager of the club, Darrell was solidly entrenched in the Atlanta starting lineup. After hitting 19 homers in 1972, his first full season in the majors, Evans enjoyed a power spike in 1973. He hit 41 home runs, scored 114 runs, and drove in 104 while batting a career-high .281 and playing in the All-Star Game for the first time. Teammates Dave Johnson (43 home runs) and Hank Aaron (40) joined Evans in the 40-homer club, making the Braves the first team in history with three 40-homer men in the same season. One of Evans’s biggest thrills in baseball came on April 8, 1974, when he reached first base on an error in the fourth inning and then scored when Hank Aaron belted his 715th career homer, breaking Babe Ruth’s long-standing record. Though his batting average fell to .240 in 1974, Evans led the National League in walks for the second season in a row and scored 99 runs. His fielding improved, and though his home-run output fell from 41 in 1973 to 25 in 1974 and 22 the following year, he was one of the bright spots for an Atlanta team that sank to the bottom of the National League West. However, Evans’s time in Atlanta was coming to an end. He was moved to first base because the Braves acquired hot prospect Jerry Royster from the Dodgers. Always a slow starter -- his career .232 batting average for April is his lowest of any month -- he began the 1976 season in a horrid slump. Though he drew at least one walk in each of his first 15 games, his average dipped below the .200 mark and stayed there. “It was the one time in my career when I really doubted myself,” Evans said. “I couldn’t seem to do anything right. I couldn’t see the ball very well and I wasn’t being patient at the plate. Then I’d take a pitch and it would be right down the middle.” In early June, with the Braves mired in fifth place and Evans’s average at .173, the club traded him and infielder Marty Perez to the San Francisco Giants for first baseman Willie Montanez and three others. Evans spent the next eight years in San Francisco. The Giants used him mostly at first base in 1976, then shuffled him around the field in 1977, with Evans seeing action at third, first, and the outfield. Late in the 1977 season, veteran slugger Willie McCovey suggested to manager Joe Altobelli that Bill Madlock be moved from third base to second base and Evans be moved to third base full time. Altobelli agreed, and Evans played only at third in 1978, 1979, and 1980. The 1978 season was the best one the Giants had during Evans’ tenure. The team played at a .500 pace through April and in early May, then won 12 of 13 to move into first place. Evans shone during the streak, hitting .381 with a .491 on-base percentage. On May 19 he went 3-for-3 with two home runs as the Giants won their eighth straight game. The Giants finished the month with a 20-6 mark. On June 11, in the middle of a seven-game winning streak, Evans went 3-for-5 with a home run, two RBIs, and three runs to help San Francisco beat the Mets 7-5. The Giants remained in first place, with the exception of one day, until August 11. However, they went 20-22 the rest of the way to finish in third place, six games out, with an 89-73 record. Evans hit only .206 down the stretch but clubbed 10 home runs during that time as the Giants finished their best season since 1971. Evans was eligible for free agency after the 1978 season, and he was unhappy that the Giants did not offer him what he and his agent, Jerry Kapstein, considered a fair deal during the season. In the early days of free agency, players could sign with only a limited number of teams, the teams determined in a draft. Evans was chosen by ten teams, short of the maximum 13, in addition to the Giants. Those teams were Oakland, San Diego, California, Cleveland, Minnesota, Milwaukee, the New York Mets, Baltimore, Los Angeles, and Montreal. The Angels and the Padres each talked to Evans, but he elected to re-sign with the Giants when they increased their offer to $1.435 million over five years, very close to his reported demand of five years and $1.5 million. After signing, Evans said, “It’s nice to feel wanted. ... Last season was enjoyable and we’re going to get better.” However, that was not to be the case, as the Giants won only 71 and 75 games over the next two seasons. It was not Evans’ fault; he had typical Darrell Evans seasons each year: hitting 17 and 20 home runs with .356 and .359 on-base averages for those two seasons. When veteran first baseman Willie McCovey retired at midseason in 1980, Darrell was named to replace the future Hall of Famer as captain of the team. The 1982 season was the Giants’ second best during Evans’ time there, but it was full of turmoil for the 35-year-old veteran. Despite statistics that were not much different than a typical Evans season (.241 average but with five home runs and a .351 on-base percentage), manager Frank Robinson announced on June 4 that Tom O’Malley would be the regular third baseman. Evans reacted strongly: “It’s hard to understand the move -- and I don’t. It’s not like I’m being replaced by a phenom who will hit 40 home runs.” Trades with the White Sox and Oakland fell through, causing Evans to retort, “I don’t understand why they would not trade one obscure player for two obscure players.” Part of the move was out of desperation as the Giants were 22-30 at the time, 8½ games out of first place. Evans saw some action at first base in June while Reggie Smith recovered from injuries and even had eight starts at shortstop in late July and early August before regaining the regular third-base job. Maybe not so coincidentally, San Francisco got hot in early August; the Giants were 50-55 on August 2 before winning 37 of their final 57 games to finish 87-75. The 1983 season, the final year of Evans’s five-year pact, was his best in San Francisco. With free agency approaching again, Darrell moved back to first base and made the All-Star team for the second time, hitting 30 home runs with 82 runs batted in. He also showed his versatility, appearing in nine games at shortstop for the injury-riddled team. Despite his advancing age, this solid performance made the 36-year-old veteran one of the most coveted players in baseball at season’s end. Many observers were surprised when the Detroit Tigers pursued Evans that fall. The Tigers had not signed a single high-priced player since the era of free agency began several years before, preferring to develop players through the farm system rather than lavish large contracts on veteran stars. However, Detroit had finished second to Baltimore in the American League East in 1983, and management believed that one more powerful left-handed hitter might move the Tigers past the defending champion Orioles. Detroit’s incumbent first baseman, Enos Cabell, also a free agent, had signed with Houston, and the Tigers looked to Evans as an upgrade at that position. After his All-Star campaign for the Giants in 1983, Evans was a hot commodity, and the bidding for his services turned into a two-team contest between the Tigers and the New York Yankees. Evans got off to a hot start with his new team. 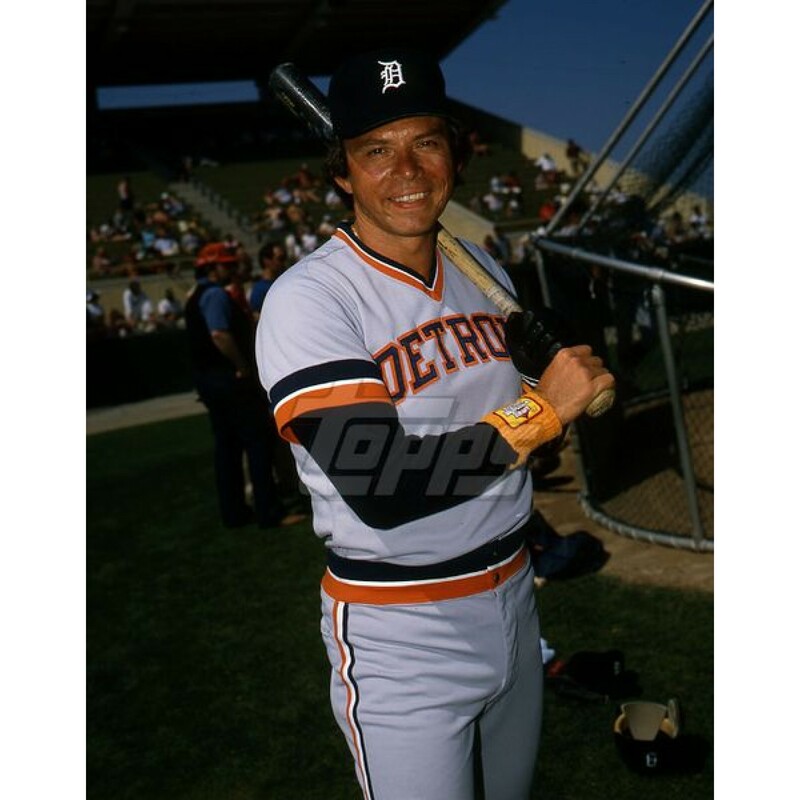 On April 3, 1984, in his first game as a Tiger, he belted a three-run homer off Minnesota’s Keith Comstock in an 8-1 Detroit win. In the home opener at Tiger Stadium on April 10, he smacked a long home run into the right-field upper deck -- already designated by one banner-waver as “Evansville” -- off Texas pitcher Dave Stewart in his first time at bat. To ease his adjustment to a new league, Anderson played him mostly against right-handed pitchers during the first two months of the season. On May 25, Evans’ batting average stood at .308, and it appeared that the team’s investment in the power-hitting first baseman had paid off. However, Evans quickly fell into a prolonged slump at the plate. Though the division-leading Tigers were winning games at a record pace, Evans’s bat went strangely silent. He hit only one home run in June, putting together a number of 0-for-3 and 0-for-4 days as his average fell with each passing week. “I’ve been getting myself out,” Evans told The Sporting News in early July. “Here I’m supposedly known as a patient hitter, and I’m chasing pitches all the time. It has to stop.” The death of his father, Richard, in July may have had an effect on Evans, as did his lack of a permanent fielding assignment. He saw action in Detroit at both first and third base, with designated hitter and pinch-hitting duties added in. Pressing at the plate, Evans saw his average fall to the .230 level, where it remained for the rest of the campaign. Evans enjoyed a few highlights in 1984. On August 20 and 21, he went 7-for-8 with two homers, scoring five runs and driving in four in two wins against Oakland. On September 11 he belted four hits, including a home run and a double, as the Tigers defeated Baltimore, 9-2. Still, such heroics were few and far between for Evans, who ended his first American League season with a .232 average and 16 home runs, only six of which came at Tiger Stadium. Despite his hitting troubles, Anderson wanted the experienced Evans in the starting lineup during the postseason, and Darrell played two games at first base and one at third as the Tigers swept the Kansas City Royals in the American League Championship Series. Evans started the 1985 season slowly amid rumors that the Tigers, disappointed with his lack of production, would soon trade him to the Yankees. On May 14, he was batting only .167 when the club brought up Mike Laga from its Nashville farm team and put him on first base, moving Evans to the designated-hitter slot. The move caused something to click with Evans, who belted homers in each of the next four games and went on an 11-for-17 tear at the plate. On June 2 Laga was returned to the minors, and Evans reclaimed first base. His yearlong hitting slump had ended as mysteriously as it had begun. Though the Tigers failed to repeat as champions, the 38-year-old Evans led the American League in home runs with 40, becoming the oldest player in the American League ever to hit 40 in a season. He also became the first player to hit 40 or more homers in each league, having hit 41 for the Braves 12 years before. At season’s end Evans was presented with the Tiger of the Year award by the Detroit baseball writers. Evans put together another fine season in 1986, with 29 home runs and 85 runs batted in, and he became a free agent again after his three-year contract expired that fall. With ownership collusion in full swing, Evans drew no interest from any team except Detroit, which offered him a one-year contract for $525,000, a 33 percent pay cut from the year before. With no other options available, he accepted the offer and returned to Detroit for the 1987 season. At 40, Evans was baseball’s oldest everyday player. “I’m not old,” he told a New York Times reporter. “I was just born before a lot of other people.” He proved that his career was not over, hitting 34 home runs with 99 runs batted in for the division champion Tigers. Age finally caught up with Evans in 1988, when he batted only .208 while sharing the starting first-base job with Dave Bergman and Ray Knight. On September 20 he hit the 400th home run of his career, off Cleveland’s John Farrell, but Evans’ tenure with the Tigers was drawing to a close. Released by Detroit at season’s end, he returned to Atlanta for one final campaign, his 21st in the major leagues. He retired after the 1989 season with a .248 career batting average and 414 home runs, a total that at the time placed him 21st on baseball’s all-time list. His total of 1,605 walks was the eighth highest of all time at the time. Evans coached for the New York Yankees in 1990 and worked as a minor-league instructor for the Tigers and the Boston Red Sox. He managed the Tyler WildCatters of the independent Texas-Louisiana League in 1997, the Wilmington Blue Rocks (Kansas City high A, Carolina League) in 1998, the Huntsville Stars (Milwaukee Double-A, Southern League) in 1999, and the Aberdeen Arsenal of the independent Atlantic League in 2000. In 2005 Evans became the first manager of the Long Beach Armada in the independent Golden Baseball League in Southern California, winning a division title in 2007. In 2008 he remained in the Golden Baseball League as a hitting coach for the Orange County Flyers, managed by Hall of Fame catcher Gary Carter. Evans managed the Victoria Seals in the same league in 2009 before being fired for looking for another managerial job while still being paid by the Seals. Another Golden Baseball League club, the St. George Roadrunners, hired him as manager for the 2010 season. At that time, Evans and his wife, LaDonna, lived in Long Beach, California. They had four grown children. Conan, Neil, Play by Play: Life in the Last Chance League. New York: Three Rivers Press. 2003. James, Bill. The New Bill James Historical Baseball Abstract. New York: The Free Press. 2000. Porter, David L., ed. Biographical Dictionary of American Sports: Baseball, revised and expanded edition. New York: Greenwood Press. 2000. Anderson, Dave. “The Second Black Manager?” New York Times, April 18, 1978. Associated Press. “Former Big-Leaguer Darrell Evans Thriving Among Huntsville Stars.” Tuscaloosa News, July 11, 1999. “Evans’ Career Begins to Take Off After Witnessing Flying Objects,” USA Today, April 12, 1984. Fish, Mike. “Evans Is Heating Up With Age.” Kansas City Times, August 30, 1985. Gage, Tom. “At 38, Evans Having His Finest Season.” The Sporting News, September 23, 1985. Lapointe, Joe. “Evans a Big Hit in Detroit.” The New York Times, September 30, 1987. Minshew, Wayne. “Evans Soars Like Rocket to Stardom.” The Sporting News, September 8, 1973. Moore, Terence. “Evans Finds Contentment in Detroit.” San Francisco Examiner, April 19, 1984. Peters, Nick. “Giants Are Jolly Over Darrell’s Decision to Stay.” The Sporting News, December 30, 1978. Peters, Nick. “Evans Frustrated as Deals Collapsed.” The Sporting News, June 28, 1982. Spander, Art. “Giant Hands-Off Policy Turned Evans’ Bat to ‘On.’” The Sporting News, July 24, 1976. Stewart, Larry. “He Passed On Pitch From Cosell.” Los Angeles Times, February 11, 2008. “Chop Talk: Evans Going to Bat for Earth,” on http://www.atlanta-braves.mlb.com/news. Darrell Evans page at http://www.baseball-reference.com/bullpen (accessed June 1, 2008). Darrell Evans page at http://www.thebaseballpage.com.